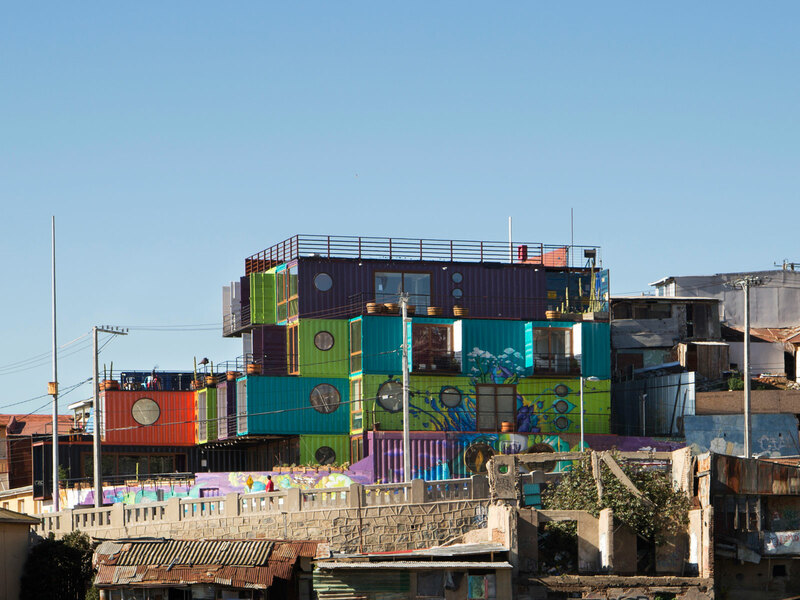 The wine-filled building is made entirely of shipping containers. “This is an architecturally crazy city,” says New Zealand-born winemaker Grant Phelps, as he hands me a glass of wine on the rooftop of his recently opened hotel, WineBox, which sits a short stroll away from Neruda’s house and museum, La Sebastiana. 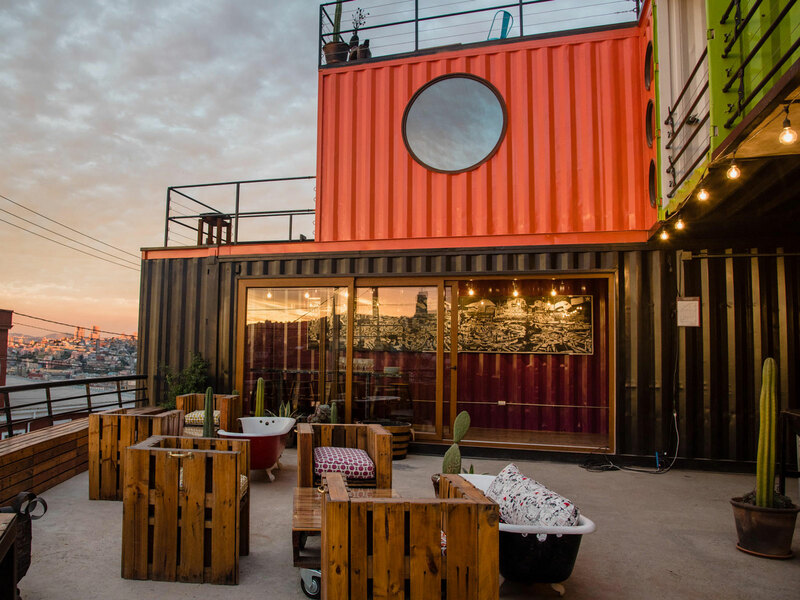 Set on a former micro landfill in Cerro Mariposa (or “butterfly hill”), one of the less-hiked of the city’s 45 hills, WineBox is constructed out of decommissioned shipping containers purchased from the nearby port of San Antonio. Each of the 25 salvaged containers (which traveled a combined 160 million kilometers before landing at WineBox) comes with a history that’s been traced back to ships carrying freight from fireworks to 119 kilos of cocaine hidden inside instant coffee jars bound for the Polish port of Gdynia. At the wine-focused hotel, recycling is a theme that reigns throughout, with everything from the furniture to the hot tub—a 160-year-old, 400-gallon Chilean wine vat—crafted from repurposed wine products. Over 3,000 wooden pallets recovered from wineries in the Casablanca Valley form bed frames and sliding bathroom doors, while a portion of 100 decommissioned barrels serve as bar stools on the rooftop. On Saturdays, the rooftop bar opens up for Ibiza-inspired sunset sessions led by a rotating roster of local winemakers like Matetic Vineyards’ Julio Bastías, who just so happened to be hosting a six-course wine dinner the night I arrived. Pop-up dinners like these, as well as graffiti workshops and wine blending sessions, are part of what makes the unconventional project feel all the more at home in Valparaíso, a city with a motley crew of bohemian characters and architectural styles that teeter from corrugated iron-lined homes and ramshackle wooden cottages to restored Victorian mansions housing boutique hotels. This is why the World Heritage City of Valpo, as locals lovingly call it, is known just as much for its Marseille-style sailor grit and quirky seaside spirit as it is for the expansive murals dotting its sloping, labyrinth-like streets. This type of eco-friendly architecture is popping up at hotels in Kuala Lumpur and Costa Rica, but the challenge in Chile is not only finding decommissioned containers that aren’t completely destroyed, it’s finding architects and contractors who know how to work with this kind of building material. Phelps couldn’t find a construction company that was either willing to do the work or that had any kind of experience with shipping containers, so he enlisted the help of his girlfriend, Camila Ulloa, who at the time was still an architecture student at Viña del Mar University. In 2015, the couple formed their own construction company and started the 18-month building process with the help of volunteers, moving the containers quickly on site over the course of two nights. Australia-based surf artist Fieldey and Valparaíso’s street art duo UnKolorDistinto are just a few of the guests who traded their craft for a stay at the construction site. Thanks to the work of these artists, the street art-covered building blends in perfectly with the rest of Valparaíso, with sea-inspired murals like the eye-catching creature with binoculars dominating the teal exterior—titled “Toast to the Porteños” as a form of homage to the people of Valparaíso’s port—as well as purple-hued ships and a bearded sailor painted by Uruguayan artist Leandro Bustamante on the walls of the basement winery­. As the first hotel in the Southern Hemisphere to produce its own wine—and the city’s first urban winery—WineBox follows Phelps’ no-waste mentality, with a 70 percent barrel-to-glass concept, meaning less wasted glass and cork. Last year, some of the hotel’s first guests helped with the winemaking process, slipping off pants, shoes and socks to punch down Cabernet Sauvignon grapes from Maipo and Syrah from Leyda, which will be available in three months when the first vintage (and Chile’s first 100-percent body-plunged wine) debuts. And while over 60 percent of Chile’s wine is exported, Phelps plans on keeping WineBox’s vino reserved for in-house guests and visitors only.